Beauty Gonzalez's feisty response to a netizen claiming that Kapamilya actress's Instagram photo revealed a glimpse of her private part: "It is just a shadow cast by my leg position and by the dark design of my swimsuit in that area. Anyway, even if I were naked I guarantee and my doctor will attest it will not be dark." Did Beauty Gonzalez just post on Instagram a bikini photo revealing a glimpse of her private part by accident? This was the question posed by a commenter on Beauty’s Instagram post yesterday, July 25. Kamukha mo si Paraluman, nun sya ay bata pa, at ang galing galing mong sumayaw mag boogie man o cha cha!???? The Instagram user, with the handle name @jane_crown1956, left a comment criticizing the Kapamilya actress’ carelessness in posting a revealing bikini photo without regard for decency. The netizen's comment read: "Hala kita na yata ang maria! Ang sagwa bakit di muna i check bago magpost?" 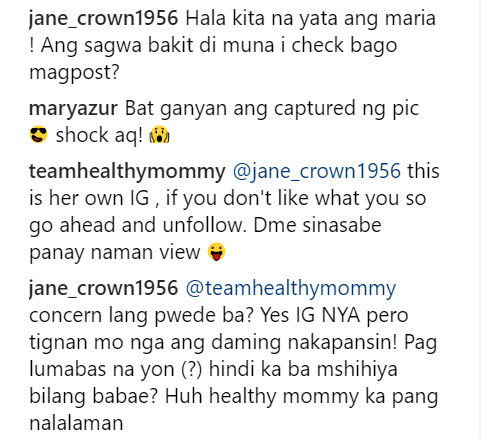 In an exchange of comments with another netizen, @jane_crown1956 added, "@teamhealthymommy concern lang pwede ba? "Yes IG NYA pero tignan mo nga ang daming nakapansin! Pag lumabas na yon (?) hindi ka ba mahihiya bilang babae?" But Beauty slammed the netizen’s comment as “malicious” and unfounded, noting that she was decently-clad in a bikini and her private part was not shown at all in the photo. 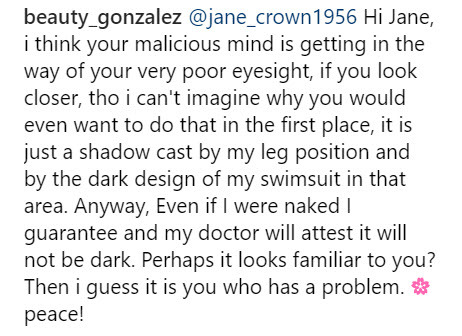 Her statement read, “Hi Jane, i think your malicious mind is getting in the way of your very poor eyesight, if you look closer, tho i can't imagine why you would even want to do that in the first place, it is just a shadow cast by my leg position and by the dark design of my swimsuit in that area." Turning the tables back to the netizen, the ever-feisty Beauty continued, “Anyway, even if I were naked I guarantee and my doctor will attest it will not be dark.